We select some products that make our Italy, our plates and Pizza great. The top ingredient flour, comes from Colli Piacentini, where expert millers produce flours that are synonym of quality and deliciousness. A lot of products come from Tuscany. The PGI and PDO extra-virgin oil comes from the Sienna Hills and from the mountains around Pisa. A excellent choice for the truffle. 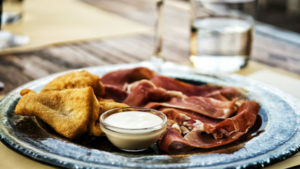 The ham- the Cinta Senese Ham PDO - comes one more time from Tuscany or better from the Apennines straddling Tuscany and Emilia. The choice of tomatoes is a different world: a real trio of taste and variegation. From Agro Nocerino Sarnese in the Southern Italy, the PDO San Marzano Tomato, from the Southern Sicily the PGI plum tomato and from Florenz the PAT (traditional Italian Regional Food Product)ribbed tomato. 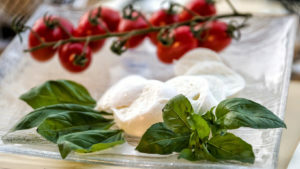 Mozzarella cheese and the POD buffalo milk mozzarella are only from Campania, where expert dairy farmers produce these high quality ingredients. Our anchovies are from Cilento’s Area, narrowly from Marina di Pisciotta, Cetara on the Amalfi Coast, and Scialla in Sicily. All these old villages are famous for processing achovies fishing and for a very old fishing technique so-called “Menaica”. Capers are from the Salina Island, from the Aeolian Island and from the caper’s mother country Pantelleria. A high quality choice for the ‘nduja, that is only from Calabria. The PAT handmade Spilinga ‘nduja is the only one soft, spicy hot, spreadable salami. About cheese, we choose only the POD Parmigiano Reggiano cheese aged 24-36 months. It has a mild and delicate flavor that reminds milk and fresh fruit. The Romualdo’s culinary innovation and experimentation means not only a variety of pizzas and delicious plates for high quality ingredients cooking but it also is continually new taste creating. The culinary tradition and experimentation go at the same speed bumping into experience of artisans and biological farmers. Romualdo’s technique has fixed rules. It’s based on a combination of flours, which are different in nutritional content (proteins, starch, minerals and fiber). Day-to-day they are tested according to the flour strength, to Gluten, to conditions of environement (temperature and humidity). Romualdo Rizzuti’s Pizza is the outcome of careful researches and constant flour experiment with art art, passion and taste for creating a natural dough…it’s the only one soft and light dough.